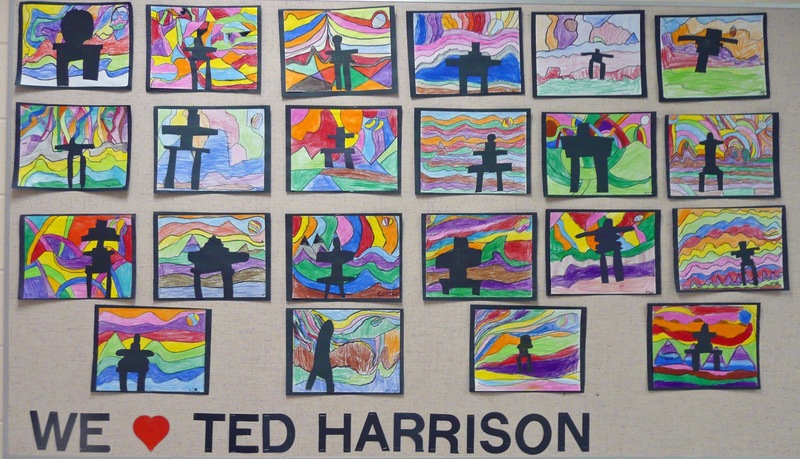 There is a lot of Ted Harrison love at the school these days. 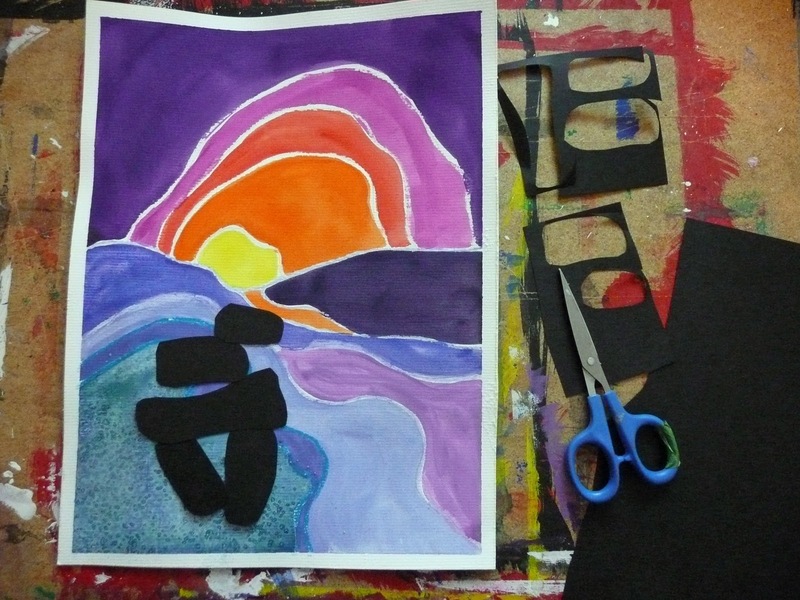 Both Grades 2 and 3 are completing art projects based on his work. Ted Harrison is a well known Canadian artist famous for his use of line and color in his landscape paintings around his beloved Yukon home. This is an easy art project based on his work. 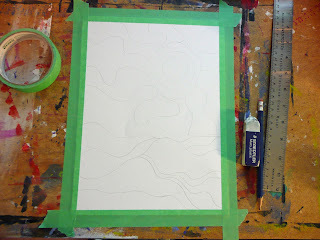 I like to tape off my paper and then draw in your line design. You want to discuss the way Ted Harrison uses a strong line to show shape or contour of the landscape, how the line is just as important as the color. With younger kids you may want to use pastels or wax crayons and draw those heavy lines. 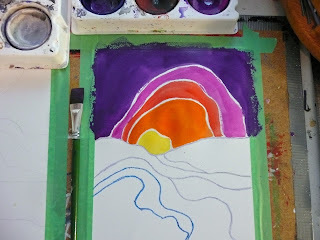 I'm using crayon here and they resist the paint allowing you to keep those heavy lines, oil pastels work even better. Start painting. 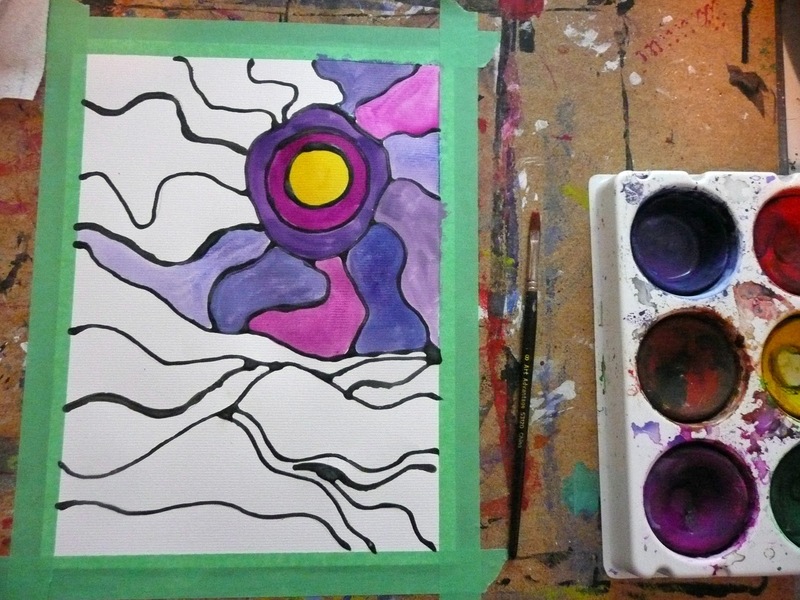 It's good to start with the lightest colors first and then work your way to the darkest. 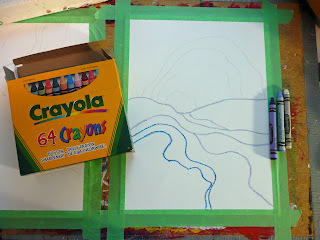 Although the crayon or pastel resists the paint you still want the kids to stay within the lines if the can so you have those separate areas of deep color. With older kids you can get them to conserve that white line. When painting with watercolors you'll want to leave some space between the colors any way so they don't mix together before drying. 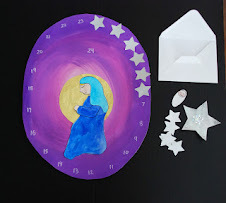 Another option is to try the stained glass method. 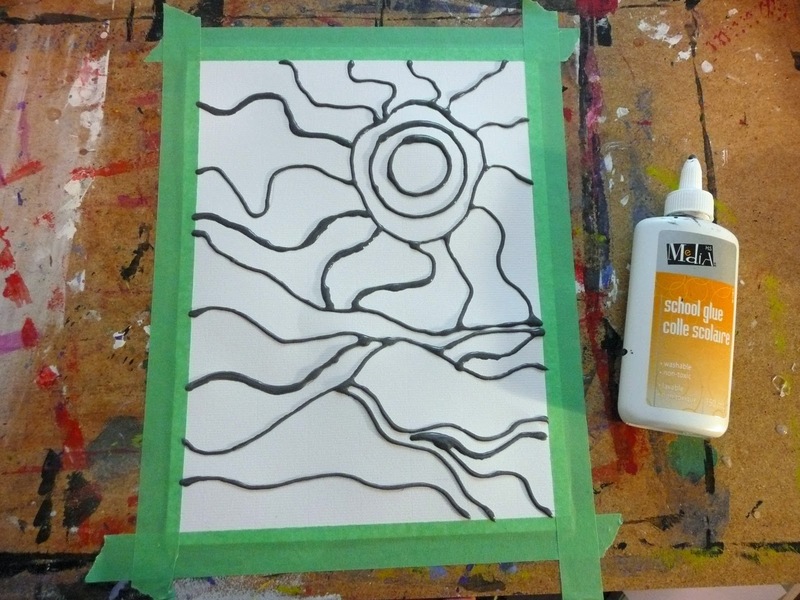 I've mixed a couple of squirts of acrylic paint into a bottle of white school glue. Once the glue is dry paint in your strong color. They glue helps to corral the paint in each area for easier painting. 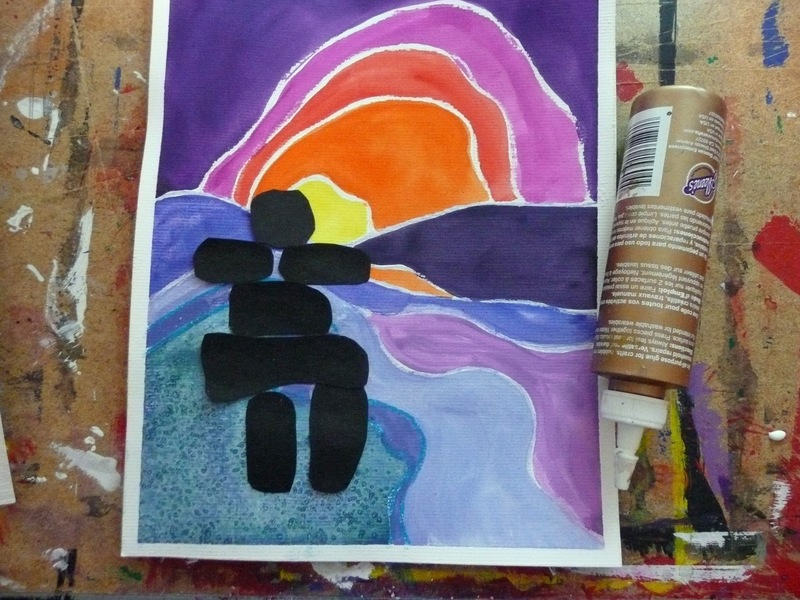 Now you can add an Inukshuk if you wish. Cut out individual stones out of black paper. Then glue down on top of your painting. Place a sheet of wax paper on top and rest a heavy book on top of that to help it dry flat. The paintings also look great just on their own. 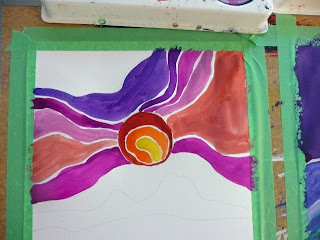 Here is some work by Grade 2. 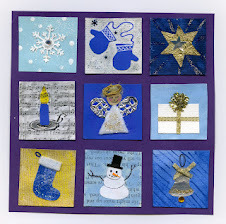 They used their twistables for this and it turned out terrific but I think they are ready to try the painting option. What a great lesson! Those colours are so bright. 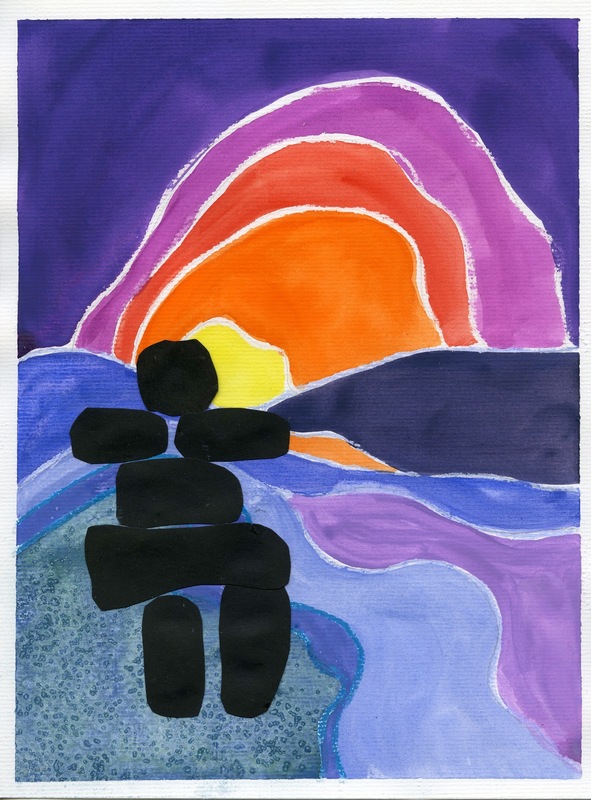 I'm always looking for art projects for younger children (I'm an elementary teacher in grade 6, and give art lessons to younger ones for one hour in two weeks ), and will add this one to my list. I never drawn with glue in the lower grades. It's worth a try. Thanks for this marvellous lesson! Did you know that now there is a book about Ted Harrison for children. It's called A Brush Full of Colour and has 24 coloured images of his paintings. Beautiful. I love Ted Harrison. With the older kids, I take his book O Canada and I get the kids to guess which province or Territory each image represents. Its great fun! I will try using watercolour the next time. I have used pastels before. These are nice! Thanks for the idea! Thanks for the tip. I did not know about Harrison. Went to his website to browse around and saw a lot of ways to apply his work to our teaching. Tried this out with my 4th graders last week. They really enjoyed the process. 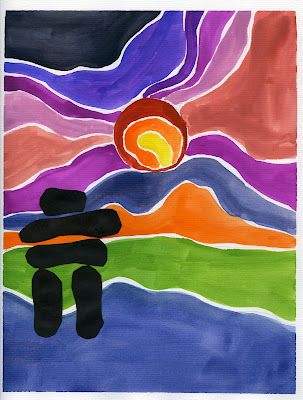 Thanks for introducing me to Ted's work the the art of the inukshuk. This is fantastic! I will try this with some of my classes in the library! Thanks. 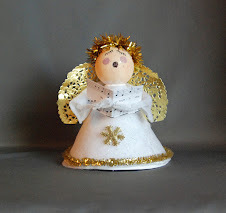 Have linked your site to my blog! It's wonderful. 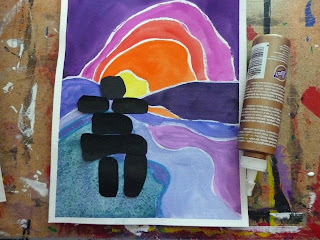 I do an art project like this with my grade 3 class, except I use black construction paper and oil pastels. 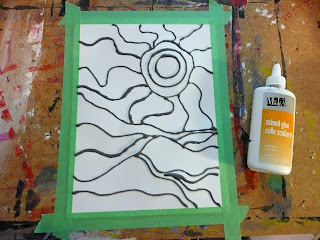 Regular elmers glue dries clear so you get a similar effect as the black glue trick. Great projects!! 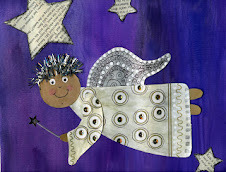 He has some great books designed for children- well worth a look. For the first picture, what is the name of that art piece? That first picture is my sample hence no name and my own design. 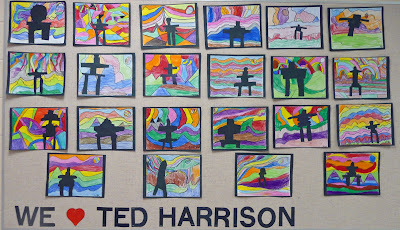 You can google Ted Harrison for examples of his work. 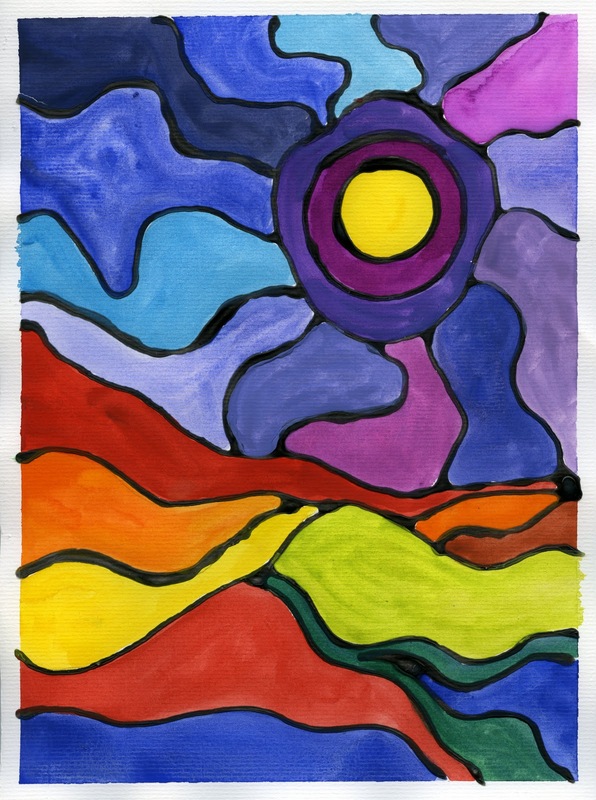 Can I use the lesson plan above for an art project I want to do with my class? Of course you can, that is the main purpose of this blog. Good luck I'm sure it will be a great art project.